Hanover, VA – On Monday, September 12, 2016, deputies responded to the 8000 block of Willow Avenue, the Spring Meadows subdivision in Mechanicsville, for a stolen vehicle. While on scene, deputies discovered another vehicle had been stolen from the same neighborhood. 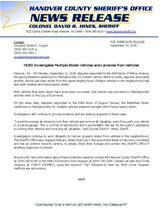 Multiple vehicles in the neighborhood had also been entered and had property stolen. Both vehicles that were stolen have since been recovered. One vehicle was recovered in Mechanicsville and the other in the City of Richmond. On the same date, deputies responded to the 5900 block of Dugout Terrace, the Battlefield Green subdivision in Mechanicsville, for multiple vehicles entered overnight which had property stolen. Investigators still continue to process evidence and are seeking suspects in these cases. “I would encourage all citizens to lock their vehicles and remove all valuables, even if you park your vehicle in a locked garage. This is a crime of opportunity and is preventable. We ask for the public’s assistance by locking their vehicles and removing all valuables,” said Colonel David R. Hines, Sheriff. Investigators continue to work diligently to recover property stolen from vehicles in the neighborhood. The Sheriff’s Office also requests that any citizen that lives in the area where these crimes were committed and has an exterior security camera, to please check their footage and contact the Sheriff’s Office if anything suspicious is noticed.